Neil Young On World Cafe : World Cafe Together with Crazy Horse, Young reworks classic American songs like "Oh! Susanna" on his 34th album. 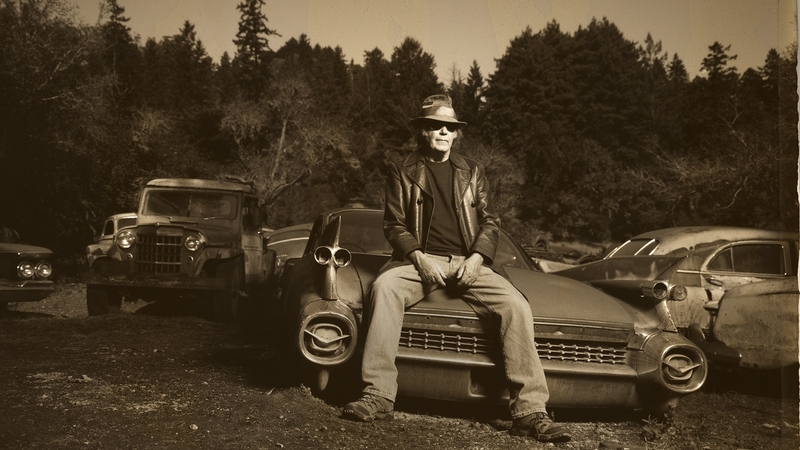 Neil Young's dozens of albums and myriad side projects showcase his incredible range and stylistic flexibility. His music has gone from the soft folk of Buffalo Springfield and Crosby, Stills, Nash & Young to the loud, raucous rock of Crazy Horse. Young has teamed up with Crazy Horse for the first time since 2003 to record Americana, which was released June 5th. Americana takes a fresh look at standards and folk songs with novel arrangements. Young brings his hard-rocking sound to songs like Stephen Foster's "Oh! Susanna" and Woody Guthrie's "This Land is Your Land" in ways that are both unexpected and strangely unsurprising. On today's World Cafe segment, Young talks with host David Dye about about including less popular verses in these campfire songs — dark verses that deal with death and starvation in the Great Depression and the Dust Bowl. Young also describes the live recording of Americana and its release on Blu-ray disc while sharing his views on sound quality, audio fidelity and why he prefers the Blu-ray format. Listen to this edition of World Cafe to hear Young's versions of classic American songs.